And then I got the dreaded email. We had missed a person off the credits. And it was one of the actors! How could this possibly happen? Well it does on low budget films. The problem is that it’s no-ones particular job to deal with making a credit list. During the shoot, a credit list is very low on the crisis management list. So this happens. The good news is that as I am writing this, After Effects is rendering a new end roller which I will drop into the various edits later today, and then I will rebuild the DVD’s and BluRay disks. As for the HDCamSR master, I am doing some clones at the weekend and hope that I can drop them onto those tapes then. It should all be fine. So like everything in life, where you lose, you gain! Sure I have to remake all the DVD masters and stuff, but I also get a better crack at getting the message of Rocketboy out there. You can view the short Rocketboy promo here… (it's 5mb H264 encoded MOV, so give it a moment to load). The first thing that strikes you when you work in an environment like MT’s grading theatre is just that – it’s a theatre. 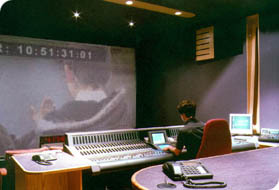 No computer screens or plasmas showing your movie, it’s up there on a cinema screen, with extremely complicated multi layered work playing back in real time. I am still reeling in shock at what we achieved in a single, but very long, day. The images already looked amazing, but now they are simply gob-smacking! 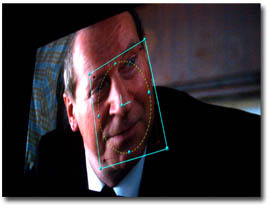 What was most impressive was the real time selective grading of small parts of the screen, such as sharpening an actors eyes to give them more presence in a shot. It’s been a very long day and there’s going to be another long day tomorrow too. I am now not sure that we will complete the grade before Xmas, but we will certainly go for it! Tomorrow, editor Eddie Hamilton will drop in too, as well as Visual Effects guy Russ Wharton so we can drop in his final marvellous work! One strange aspect today was sitting in this silent, darkened and sedate theatre – and then going outside into the freezing cold circus that it late night Soho only a few days before Christmas! It really was like stepping into a whirl wind. I have been frantically dashing around, making sure everything is ready for the final picture conform / picture grade tomorrow at Midnight Transfer. Thankfully I have been pretty organised through the whole process, so while it’s a long haul, so far there have been very few unforeseen hitches. Let’s hope it stays that way. (pictured here is our Ace picture grader, John Claude in action at MT). The final picture conform is like the full stop at the end of a sentence. Once it’s done, the image is creatively completed. This final stage is where all the various elements are brought together and made to feel like a single element, as though the happened ‘in reality’. For instance, all the images will be colour tweaked to make sure they look the same (remember some shots were filmed weeks apart, with different weather and yet they should still look like they happened in the same moment). 1. The 35mm film negative. This is the actual film from the camera, a negative, that has been scanned on Midnight Transfers Northlight Film Scanner. 2. The special effects. Theses are image sequences that were edited and manipulated on Adobe After Effects by Russ Wharton, and saved as a DPX image stream. 3. Titles. I am hoping to get them all nailed down tonight and created as hi res tiff’s in Photoshop, with one ENORMOUS long tiff for the end roller. 4. HiDef HiSpeed Images – we shot some images on a high speed High Def camera, and those also need importing and lining up. All of this is really rather simple on paper, but in the real world, it can be a headache as every film is like a prototype. The smallest error can send things cart wheeling in the wrong direction… and let’s not even get into data movement. At this resolution, single image frame sizes are around 12mb! I bought a half terabyte USB2 drive to back up all the data once it’s completed! Blimey. Blimey! I really mean it. Blimey! How amazing is that!? Above is the original image, shot by second unit director Simon Cox, and the image below is the final matte painting, Audrius Urbonavicius did for us, and comped into place. Above the new mountains are some whispy clouds which will be animated to enhance the realism. All the work was done by Audrius in Photoshop, ending up with a multi layered image that was 16bit and over 200mb for the single frame. What is amazing about this is how fast he was able to work. He really is an extremely talented artist. The shot only appears briefly in the film, as an establishing shot, and it will be dropped into the final grade, probably on Friday, when we will all see it in its final glory… at full film resolution. I CAN’T WAIT!!!!! Pictures speak louder than words, so that’s enough for the blog today! Well done Audrius and thank you Men From Mars! 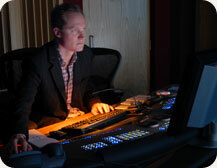 Russ Wharton, VFX whizz in Wales, has just completed three shots for Gone Fishing. This is of course a low res version and not in the correct aspect ratio, but blimey Russ, job WELL DONE! So good is Russ’ work, I have now sent him three more shots. I will report on his ongoing progress as we get to each shot. 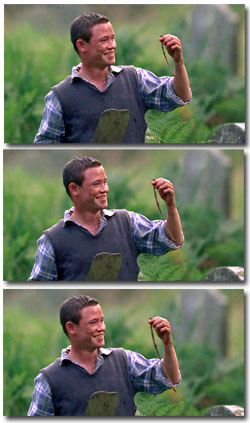 If you know you need a bigger worm before you film, then film the actor without the worm (have him hold a small white headed pin instead) and film the worm full frame against a keyable background (like a greenscreen). Then the worm can just replace the pin. Job Done. We need to scale the worm. Which means we need it separate from its background. Speed of movement won't be accurate, big things have weight and move slower. Take some neat (no mo blur) frames into photoshop and use to create just one new superworm image. Scale where poss and clone in some detail so we've got a nice sharp 200% worm to work with. Save out a .psd image with an alpha channel. Animate the worm - put this image into AE and deform it over time (slightly embarrassed to say I used the new puppet tool - I thought this was a bit pointless when I saw they introduced it in the new version, but for this it was perfect!). Copy the original worm motion for this. Then slow it down! Our 200% superworm will be weightier than its smaller sibling. I slowed it down by a third. Tip - If you want an easier animating life, have one of those fancy computer things do the work for you (that's what they're for). Use motion tracking to follow the plate your matching (in this case the hand) and you've already got half the movement done! Very useful on slow moving objects, where hand animated imperfections show up easily. Clean the background plate: anywhere the old worm shows up behind the new one you'll have to remove it! Its sometimes easiest to use an earlier part of the footage where the plate is clean as source. Add edge feathering/light wrap — Remember the background bleeding that was such a problem in the first place? Well now we need to put it back! Using a duplicate of the background plate that's been cut out by a feathered edge matte of the worm. Add a touch of motion blur and season to taste (depends on the shutter speed used when filming). Put anything back on top of the worm that needs to be there — like fingers and grass. Again, use cut out duplicates of the background plate. Finally, add a sprinkling of minor colour correction (to the worm, don't touch the plate) and leave to render for about 10 mins (depends on oven speed). How big is your worm? Sometimes, I reflect on what I do, and I really have to pinch myself. Most people have real jobs! Sure, what I do means I live in a famine and hope for a feast, but every day is different. 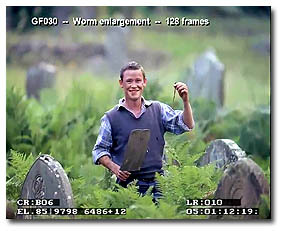 And today, I was presented with the very serious question of ‘how big should the worm dug up by young Bill in Gone Fishing actually be?’ VFX artist, Russ Wharton spent the weekend rotoscoping the shot, and then expanding the worm at increments of 25%. So now I have to choose. 125%? 150% or 200% worm increase! Before we did the effect, I thought it would be 150% increase, but now I see it, I am plumbing for 200% enlargement. No digital worm here, the same worm just cut out and blown up to twice its size and then dropped on top of the old 100% sized worm and thus covering it. Cunning. Well done Russ for this exceptional work. I can’t wait to see the finished version. 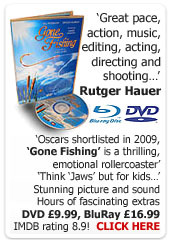 I have been working on the one day course for the contributors of Gone Fishing today, and building the DVD with the clips. 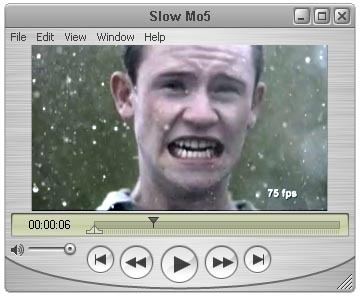 I have lots of video goodies, including this one here, which illustrates different slow motion frame rates. For some scenes we used an electronic High Speed camera which came in a van and needed super cooled computers and loads of hard disk space. It could shoot up to 2200 frames per second, so you can see why it needed so much kit. Light was also essential, you needed lots of it, so thankfully we were shooting in bright daylight. The camera actually shot a square frame, 1024 x 1024, and these frames were saved as a TIFF stream. I handed the camera guys a half gig drive to copy the media across to after the days shooting and walked away with it at the end of the day. Simple and efficient. Back to the course… the best part of this course, and I have said it on the blog before, is going to be going through the development of the story, through scripts, shooting, editing, sound, music and mastering. The different edits are fascinating to watch in order, and to see how the film grows and is crafted in each different edit. I can’t wait to present it to the group! We have begun the visual effects stage for Gone Fishing! Hoorah! 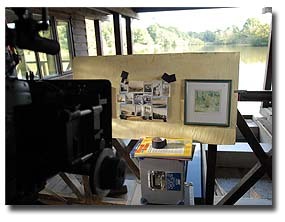 Yesterday, Midnight Transfer took the 35mm film and scanned selected shots on their Northlight scanner. The shots were outlined in a EDL supplied by Eddie Hamilton (Editor) and are just the shots that need visual effects work. We shot both 3perf and 4perf 35mm film, and when scanned, the 3perf frames come in at about 9mb each the 4perf coming in at 12mb (per frame that is!!!!). 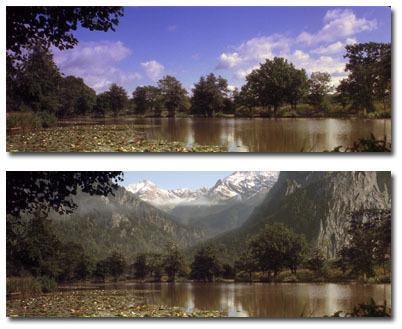 Each frame is saved in a format called DPX, which are RGB encoded with 16 bits per channel. The big thing to note is that the scans are VERY low contrast, as you can see from the picture (left is the raw scan, right I have adjusted the levels in Photoshop to look more like the final image will appear). The six shots ended up at around 12gb which Midnight Transfer saved to an external USB2 HD that was dropped off last week. The next step is a meeting on Monday with Men From Mars, who are doing the actual effects. I have committed to doing one effect myself, using After Effects - it’s a really simple shot, and MFM have promised to hold my hand through the entire process. I will report on my progress and what I learn on the blog. We have been editing, testing, editing, testing… and getting great results and feedback in these screenings. In some ways we are now slipping into analysis paralysis on some points, but on others, we are really having to fine tune the edit. For me, great movies stretch the credible right to the very edge. You take the viewer right to the very limit of plausibility, but never past that point. Hollywood movies tend to do this very well. We are having such a plausibility debate right now with Gone Fishing, with specific regard to how big viewers thought the enormous killer pike in the story actually was. In previous edits we didn’t have the new footage we shot last week (of Brucey, our big rubber pike), but now we have it in place, we are getting all sorts of sizes quoted. These shots, no matter how impressive, scale the fish. And here is a great one! One test viewer said of our big rubber pike, ‘It was clearly a real fish the you filmed, and so it can’t have been bigger than a couple of feet!’ Blimey. Our effects are so good they are working against us. The solution is of course to be minimal in what we reveal. So it’s back to the edit to modify once more. This is one of the reasons I love editing so much. We really get the chance to craft the story to perform like a sports car. These tiny tweaks, cummulatively, make such a difference. Last night, after a small re-edit, we held another test screening. Results were as usual very interesting. No revelations this time, just amplifications on what we already knew, and a few more ideas to integrate into final picture grading. At some point, screenings like these start slipping into opinion – which isn’t much use. Analysis paralysis! We only need to know what worked and what didn’t in terms of story mechanics. So we are now pretty clear, the story is working as we intended. We are now effectively picture locked, and we can get on with the visual effects, audio track lay, picture grading and final mastering. I have begun the process of getting the neg scanned for VFX, so let’s see how fast we can get those special effects shots done! The final picture element to lock down is the end roller, and editor Eddie Hamilton is going to be making a temp roller tonight so we can lock down length and timing. 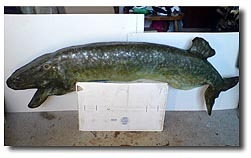 Today I collected our three and a half foot animatronic – well actually, hand puppet – monster pike. It was made by effects guru Jenny Cochrane and it weighs A TON! 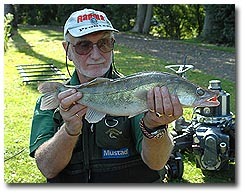 This fish is never going to be seen out of water, only in the murky shallows as it battles with Young Bill. 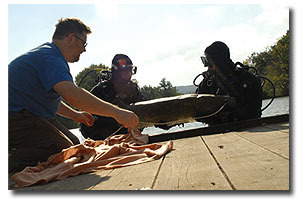 We will need two submerged operators, one for the head, one for the tail. Being operated by humans, this will also give it the movement of something alive, and not the movement of a mechanism. The head is effectively a glove puppet, giving the operator full control over head thrashing and jaws snapping. Having worked in effects before, I know how well this will work, and I am delighted I resisted using a real pike. I love this kind of effect, that will rely on a hint and a glimpse, rather than the current visual barrage of digital effects. The mind is so much more powerful. 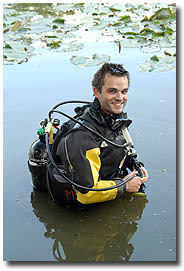 During the main shoot, stunt co-ordinator Jude Poyer donned a dry suit from diving company Diving Leisure London who are breaking into film hire and have been fantastic. We hope Jude will be coming back to operate the killer pike. We hope those lovely guys at Diving Leisure London will come back too. Before the main shoot, Jenny was concerned about the deadline, and so I made the choice to give her the time to get it right rather than hurry it. I am glad we did as we will now get a huge amount of time on Wednesday to get the shots right too. Anything like this always takes a long time to get right, and I am so glad we wont have a crew of 35 and actors all hanging around to watch. 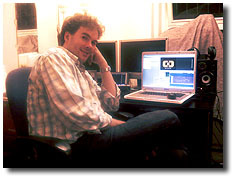 Editor, Eddie Hamilton then created a VFX (visual effects) EDL (Edit Decision List or Cutting List) in Avid which lists each shot, plus 10 frame handles on either side (should we want to make it a smidge longer in the final version). Post Production company Midnight Transfer will then scan the 35mm negative and supply those files on a hard drive in DPX format (Wiki Link). 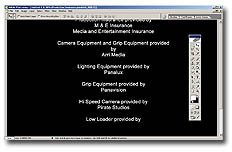 These files look like film negative (effectively very low contrast and with an orange colour hue) and so they need a special Look-Up-Table, which effectively changes they way the colours are displayed on a computer so when a VFX artist makes changes, they will look how they would in the final print. So then Men From Mars will do the effect – in this shot they will rotoscope the worm and increase it by 50% (note the name of this Quicktime file and all the burn in detail in the frame, which all helps the VFX guys). It should just sit ontop of the hole where the old worm was, and look 50% bigger! Crafty! No CGI worms needed. Like so many effects shots, the simplest way is of the best. At that point I guess I will approve the shot and then the files will be saved to disk and taken back to Midnight Transfer to be integrated into the final DI of the movie, and graded to match the other shots. All sounds so simple. Let’s hope that it is. What I am looking forward to is going through the whole process so I can speak with experience about the problems and hurdles when working with DPX files, lookup tables etc. This to me seems like that stage most people know very little about. Once this shot has been done, I will post a clip for us all to see. Still working on music for Gone Fishing. We have entered that dreaded stage where we have fallen in love with the temporary music we used, and anything else, just does not do the same job. This is a typical problem and I am trying hard to stay focussed on a solution and not on what I feel I am losing. In fact I am not losing anything as there is no way I could ever use the John Williams tracks we laid into the edit as temp music. On the upside, we did start track laying with music from Audio Network and that has gone very well, especially for the ethereal parts of the score. The problem scenes we have are the big dramatic battle scenes between Pike and boy. Jaws for kids as it were. 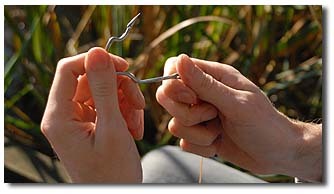 On Sunday we collect the killer Pike from FX guru Jenny Cochrane and get it into the water on Wednesday for the shoot. Interestingly, during test screenings, no-one has commented on the lack of a pike in the edit, in fact, I am now thinking it may be better never to show the pike at all. It seems everyone has their own imaginary fish that will probably be bigger and nastier than whatever we shoot. I am sure we will get some subtle underwater glimpses of our animatronic pike, but I am now wondering if we will use it in the way we initially thought we would. We will see what happens on Wednesday. I hope we get AMAZING footage. This only serves to highlight the creative journey and how much is lost on that journey. You shoot so much and throw most it away. The same is true with ideas. It’ s just a very lossy process. Sound Recordist, Killer Pike and Killer Bunnies! Great news today. 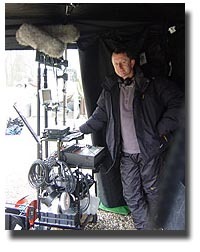 Experienced sound recordist Adrian Bell has agreed to record sound on ‘Gone Fishing’. This is particularly good news for me as Adrian recorded sound on my first feature film, ‘The Runner’, the movie that inspired ‘The Guerilla Film Makers Handbook’! So terrific! Adrians website is here. He will be using hard drive recorders which is a firsat for me. I am looking forward to the benefits. We also enlisted the help of Mike Tucker at the The Model Unit. Mike is a legend, and wandering around his studio was like going down memory lane for me. He even had the original K9 from Dr Who, which he told me he rescued from a skip at the BBC! Blimey. And here is another idea for getting a fish to flop around in the water, from Phil Mathews, my effects friend. 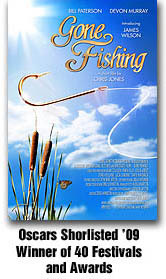 I have been working out how do some of the visual effects for ‘Gone Fishing’. Of course having no money, it’s a sellotape and string affair. But, I now have recieved tremendous support from a special effects company called Men From Mars. These digital effects guys are real wizards and usually work on $50m movies, but they have agreed to help out on GF! Blimey! Brilliant! 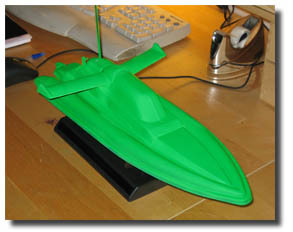 So, what we will do is shoot the boat in the water, creating ripples – which I have now sprayed green (in the pic) – and then shoot a second ‘clean’ plate with no boat. The boat will be digitally removed to reveal the clean plate below, effectively giving the impression of water ripples but nothing on the surface making them. We may need to add a digital fish fin later, but I am hopeful that we will need to do minimal digital work. Fantastic! We will be doing our first tests in the next few days at the lake location.